Permits have risen steadily from a low of 1,007 units permitted in 2009 to 10,319 in 2017. Despite this, experts say housing has not accelerated enough to meet anticipated demand. Meanwhile, amid Greater Portland’s housing and affordability crisis, the Portland City Council implemented inclusionary zoning (IZ) on February 1, 2017. 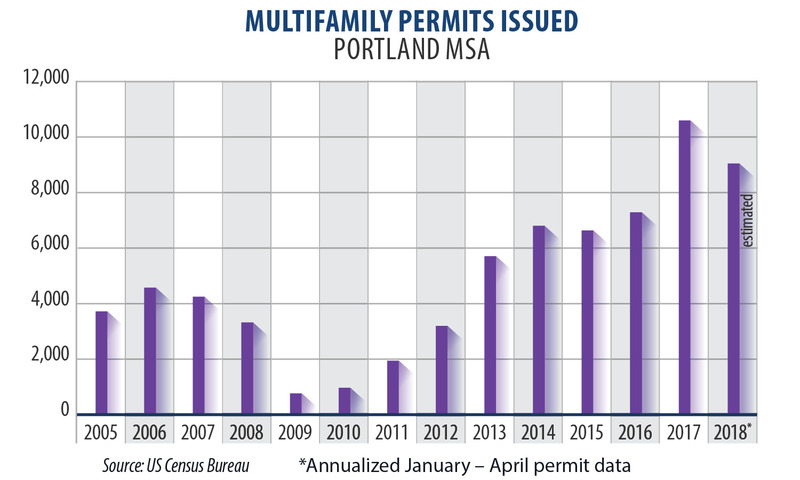 Since then, permit applications in the City of Portland have dropped significantly. Of an estimated 25,000 affordable units needed, only 170 units have been permitted under the IZ guidelines. Publicly, city leaders appear unconcerned by this drop-off in permitting activity—citing a pipeline of approximately 19,000 market-rate pre-IZ units. It will be interesting to see how many projects that were permitted pre-IZ will be shelved as a result of increased cost of labor and materials. 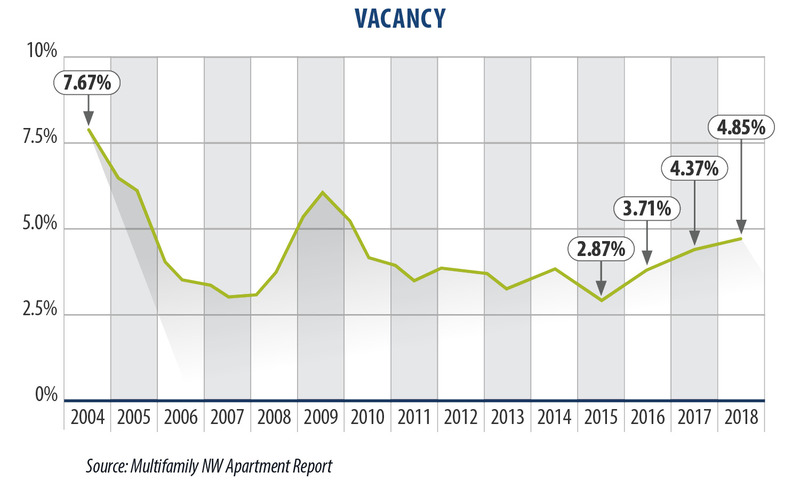 Since 2015, there has been a significant increase in vacancies—but remains below five percent. Concessions appear largely in Class A close-in projects. Portland has new supply that has yet to be absorbed. 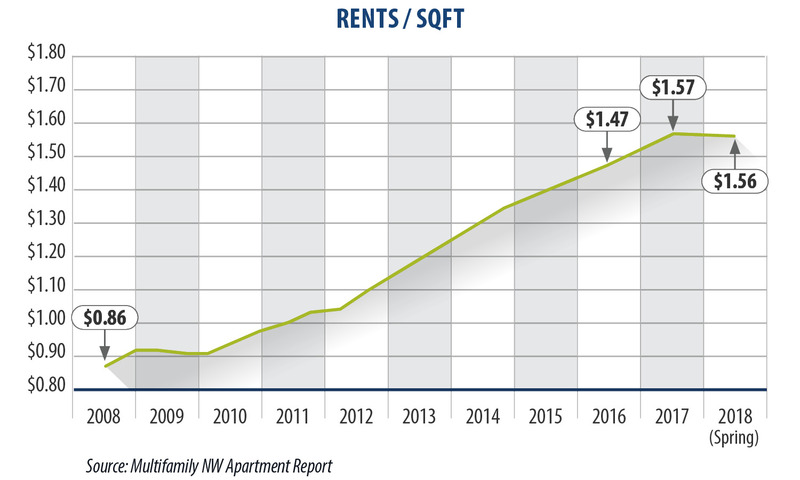 For the first time since 2009, rents were flat in April over a year earlier according to Multifamily NW. Meanwhile, the national data firm REIS pegged Portland’s calendar year 2017 rent growth above three percent. 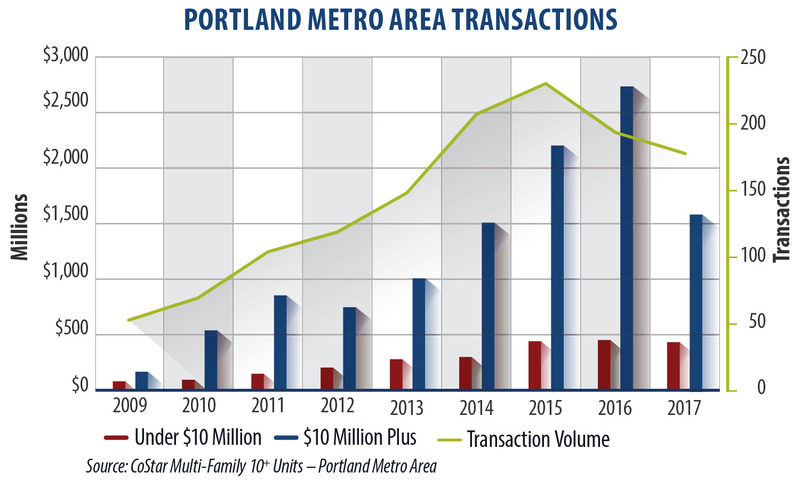 Portland saw high transaction volume in 2017, but not as high as in 2016. Much of that has to do with institutional properties above $10 million. There were 51 institutional transactions in 2016 compared to 37 in 2017. On the private client side—properties valued at less than $10 million—we saw only a slight decrease in transactions from 2016 to 2017. Trends for 2018 appear more or less flat but cannot yet be reliably identified. Recently, the City of Portland began requiring all landlords to pay tenant relocation fees ranging from $2,900 to $4,500 based on unit size. This fall, the city council will vote on adopting a warning notice to be posted on unreinforced masonry (URM) buildings, and next June will vote whether to require seismic retrofits. Portland has budgeted funds for a landlord registry, and Commissioner Chloe Eudaly has proposed adoption of a mandatory—and contentious—tenant screening assessment. Greater Portland’s metro government is under pressure to expand the area’s urban growth boundary and appears more willing to do so than in years past. The End of Rent Control and No-Cause Evictions? When a new Oregon legislative session begins in early 2019, rental property owners will face a legislature composed of members more inclined than ever to scrap the state ban on rent control and to perhaps end no-cause evictions. We anticipate a lack of on-market product even though significant capital remains available for investment. With rent growth slowing, potential changes to landlord-tenant laws at the city and state level, and recent federal tax changes—many owners are taking a wait-and-see attitude. Greg Frick is a partner with HFO Investment Real Estate, now celebrating its 19th year in business. HFO has brokered over 25,000 units valued at $2.5 billion throughout Oregon and Washington. Greg works with both private market and institutional clients and can be reached directly by phone at (503) 241-5541 or e-mail at greg@hfore.com.